I’ve recently prepared crab wontons at home and they were a huge hit! Such a huge hit that I’ve made them about four times in just the last 10 days! I have a feeling you’ll be hooked on crab wontons too once you try this simple recipe! 1. Let 2 packs of cream cheese reach room temperature. 2. Shred two 8 oz packs of imitation crab (or real crab). 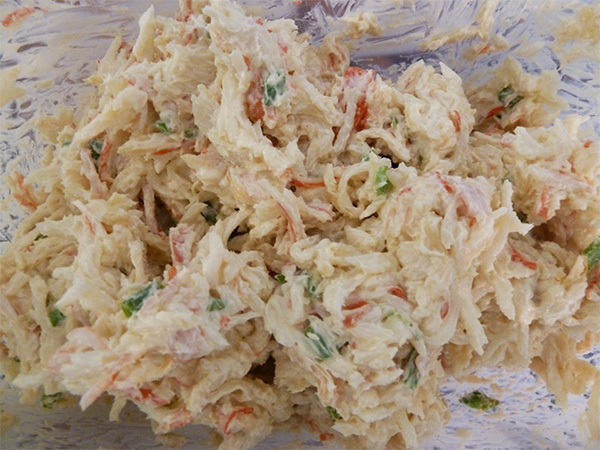 You can shred the crab meat by hand. I make enough to fry another round of wontons the same week. Feel free to cut this recipe in half. 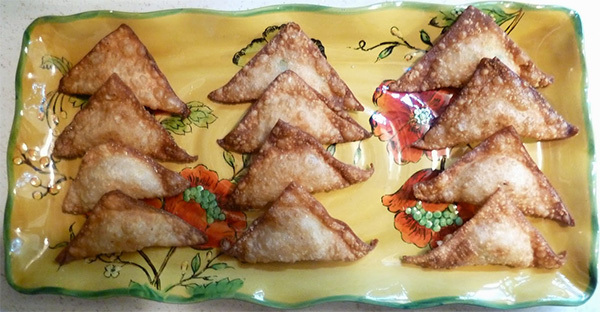 I make two batches of about 30 wontons each with this recipe. 2. Chop 1/3 cup of green onions. Add green onions to bowl with crab. 3. Cut softened cream cheese into cubes and add to your bowl. 4. Add 1 tbsp. of Worcestershire sauce, 1 tbsp. of soy sauce, and 1 tsp. of garlic into the bowl. Combine all ingredients by hand. It’s messy, but the best way! Salt to taste. The soy sauce may provide enough salt depending on your taste. 5. Heat oil for frying wontons on medium heat (around 4-5 heat). 6. Prepare wontons by wetting the edges of the wonton wrapper and add one spoon of the crab mixture to the center of the wonton. Fold into a triangle and close the edges together. I keep a small cup with water nearby for preparing the wonton wrappers. 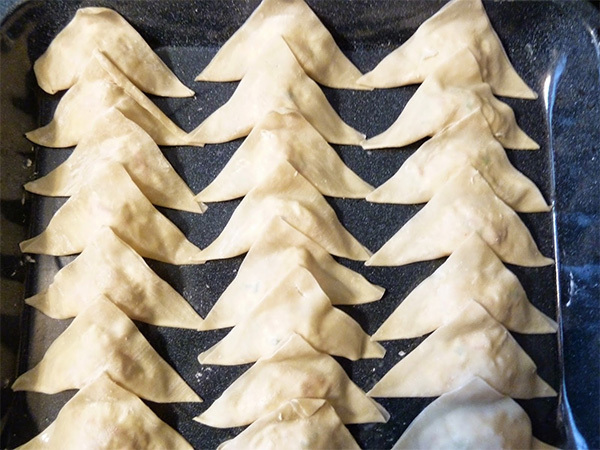 Filling and folding the wontons is a great activity to ask your friends and family to help you with! 7. Sit prepared wontons in the refrigerator for 20-30 minutes before frying for best results (but not a requirement). 8. Lastly, fry your wontons for about 3 minutes or until they are brown and crispy. Sit hot wontons on a plate with paper towels to drain oil. 9. Serve with sweet and sour sauce. Enjoy! Please let me know if you make your own crab wontons at home! I’d love to hear how they turned out!